Today is the last pie recipe of the week. And it’s a classic: pumpkin pie. Every time I make pumpkin pie, I can never remember how I made it the last time. Was it the recipe on the a pumpkin puree can? From a cookbook? From a website? 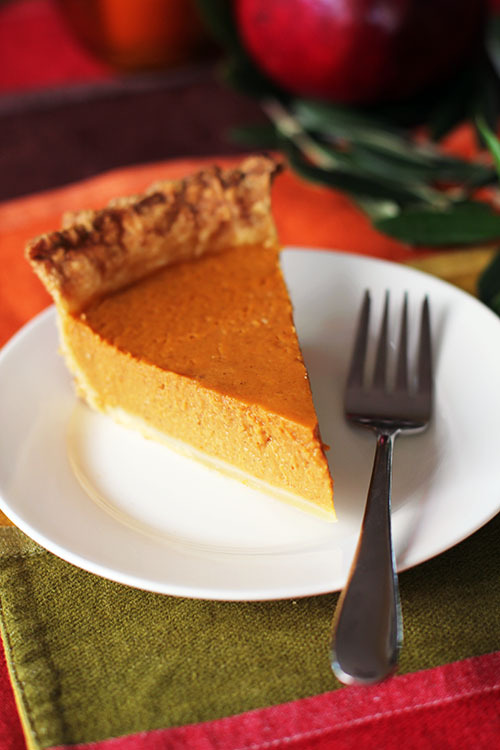 I do know that I once used a pumpkin pie recipe I saw on the America’s Test Kitchen TV show and it came out beautifully – the pie didn’t even crack! But that recipe is a little involved (it’s very similar to the one in the Cook’s Illustrated cookbook), so I rarely feel like tackling it. When I try other recipes, well, I never keep track of which one I’ve tried. So, this year, I paid attention. I made notes. And I’m putting what I did in this blog post…I’ll never have to dig around again! This pumpkin pie recipe is very straightforward. Nothing crazy, just subtly-spiced, wonderful, creamy pumpkin pie. This recipe is originally from The America’s Test Kitchen Family Cookbook. This ATK recipe is a bit simpler than the one I tried a few years ago, but has nearly identical technique. This year’s pie did crack, but we decided that we don’t care if our pumpkin pie cracks. The cracks give it character! There are a few aspects to the technique of this recipe that make the pie come out nicely (thanks, America’s Test Kitchen!). First, the pumpkin gets mixed in the food processor, to eliminate any fibers and make the filling smoother. Second, you cook the pumpkin, spices and sugar on the stovetop. The America’s Test Kitchen Family Cookbook says this improves flavor, but the Cook’s Illustrated recipe also says that it helps you get the right amount of moisture in the pie filling. Lastly, the filling is warm when it is added to the warm crust, which helps with the overall texture of the pie custard and the crust. So, here you go! 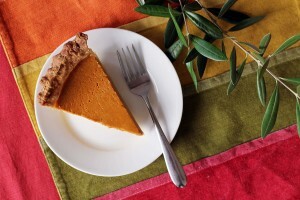 The pumpkin pie recipe I will use from here on out! Adapted from The America's Test Kitchen Family Cookbook - I cut way back on the amount of spices in this recipe, but the rest of the recipe is pretty much the same. I use a different crust recipe than they do and I rewrote some of the instructions to reflect exactly what I did. 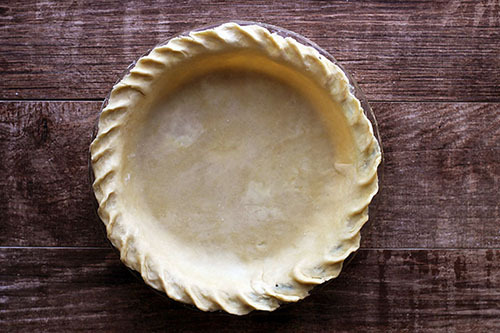 Once your pie crust is rolled out and in a 9.75-inch pie dish, freeze for 30 minutes. 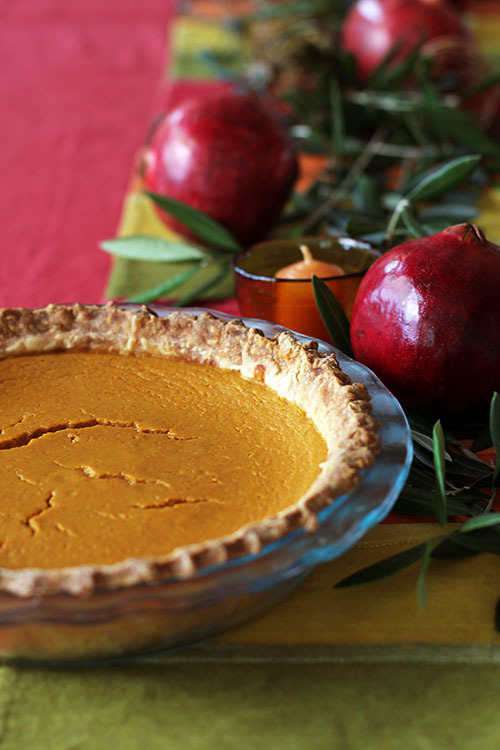 Preheat oven to 375º F. Remove pie crust from freezer and line the pie crust with a double layer of non-stick aluminum foil (non-stick side down), covering the edges. Fill the pie crust with beans (about 1½ pounds), pennies, or pie weights. Bake for 25 minutes. While the pie crust is doing the blind bake, make the pumpkin filling. You want to fill the crust with the pumpkin filling while the crust is hot from the blind bake, so it's important to make the pumpkin filling while the crust is baking. Process the pumpkin, brown sugar, spices and salt in a food processor for about 1 minute. Transfer the pumpkin mixture to a medium pot and bring to a simmer over medium-high heat. (Leave the processor as is...you're going to use it again in a few minutes, no need to clean!) Stir constantly to avoid the pumpkin bubbling and exploding all over your stove. Cook for about 5 minutes, until thick and shiny. Whisk in the milk and cream, bring mixture back to a simmer, then remove from heat. Place the eggs in the food processor and process until uniform, about 5 seconds. With the machine running, slowly add about half of the hot pumpkin mixture through the feed tube. Stop the machine, add the rest of the pumpkin and process again for about 30 more seconds until everything is uniform. The timing should work so that the pumpkin filling is done and warm when the pie crust is done blind baking. When you remove the partially-baked crust from the oven, turn the temperature up to 400º F and remove the pie weights you used and the foil. 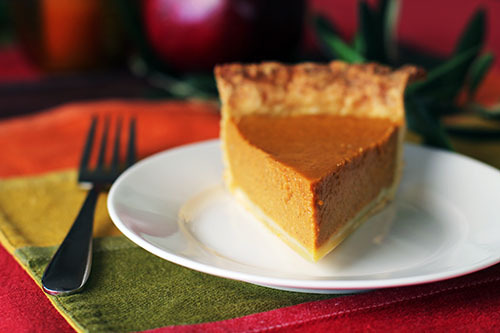 Immediately pour the warm pumpkin filling into the hot partially baked crust. If you have extra filling, ladel it into the crust 5 minutes into the baking time. Bake the pie until the filling is puffed and lightly cracked around the edges and the center wiggles slightly when jiggled, about 25 minutes. Cool pie on a wire rack and serve warm or at room temperature. Store leftover pie in the refrigerator, wrapped, up to 2 days. From "Pie School: Lessons in Fruit, Flour and Butter" by Kate Lebo. Reprinted with permission. Fill a spouted liquid measuring cup with about 1½ cups of water, plop in some ice cubes, and place it in the freezer while you prepare the next steps of the recipe. The idea is to have more water than you need for the recipe (which will probably use ½ cup or less) at a very cold temperature, not to actually freeze the water or use all 1½ cups in the dough. In a large bowl, mix the flour, sugar, and salt. Cut ½- to 1-tablespoon pieces of butter and drop them into the flour. Toss the fat with the flour to evenly distribute it. Position your hands palms up, fingers loosely curled. Scoop up flour and fat and rub it between your thumb and fingers, letting it fall back into the bowl after rubbing. Do this, reaching into the bottom and around the sides to incorporate all the flour into the fat, until the mixture is slightly yellow, slightly damp. It should be chunky””mostly pea-size with some almond- and cherry-size pieces. The smaller bits should resemble coarse cornmeal. With firm, brief pressure, gather the dough in 2 roughly equal balls (if one is larger, use that for the bottom crust). Quickly form the dough into thick disks using your palms and thumbs. Wrap the disks individually in plastic wrap. Refrigerate for an hour to 3 days before rolling. Click here to read my (as in Jane's) instructions and photos for rolling out the pie crust. Click here to see my instructions and photos for rolling out pie crust. 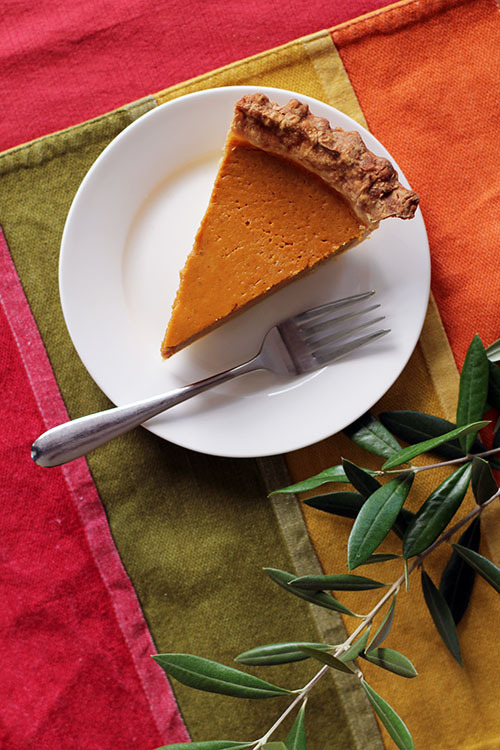 I just got finished posting a pumpkin pie recipe myself…from ATK of course! This one uses yams and cooks the filling first. My 8 year old did all the work so that has to count as “Family”, right? Anyway, it was amazing.